Where: Finneran Pavilion, Villanova, Pa.
Last Time Out: Villanova defeated Quinnipiac 86-53 on Saturday, Michigan defeated Holy Cross 56-37 on Saturday. Michigan is not the same team that it was a season ago, having lost much of its scoring to graduation. Specifically, they’re down Moritz Wagner and Duncan Robinson, who were the heart of the squad as well as about 50 percent of the offense. The returning Wolverines haven’t figured out the offensive side of the ball yet, as evidenced in their two victories over Norfolk State and Holy Cross. So far, Michigan has scored just 119 points in two games and ranks 310th in the nation in scoring. Right now, only Charles Matthews and Ignas Brazdeikis are doing any scoring, combining for 30.5 points per game, over half the Wolverines’ offense. So how are the Wolverines 2-0 and ranked in the top 20 in the nation? Simple: it’s a John Beilein-coached team, and that means one thing above all else: Michigan knows how to play defense. It doesn’t matter that you’re only scoring 59.5 points per game when you only give up 40.5 points a game in the first place. 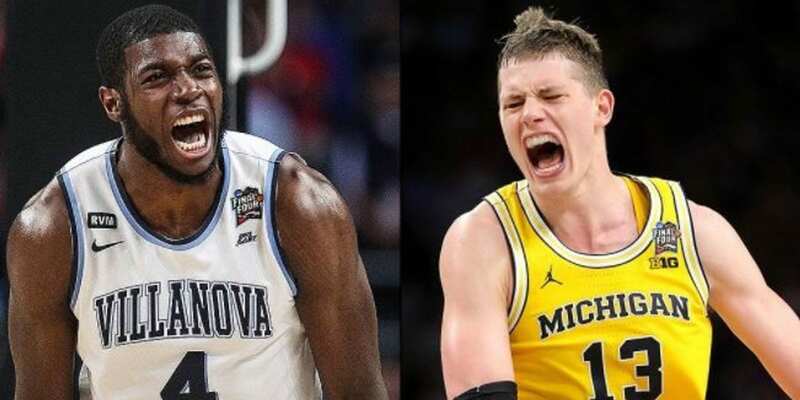 The Maize and Blue showed how well they could defend against Villanova a year ago in the title game up until Donte DiVincenzo came off the bench and had the game of his life, and Michigan hasn’t forgotten how to make life difficult for a good shooting team. Throw in that the Wolverines are a top 20 team on the glass, and Villanova’s normally high-flying offense will be in for a challenge. Villanova starts with guard Phil Booth, but he’s far from the only weapon at coach Jay Wright’s disposal. Forward Eric Paschall is still a dominant presence inside, and even when he’s not, the Wildcats are deep enough to overcome a bad night from one of their two stars. Case in point: the Wildcats’ blowout win over Quinnipiac saw Paschall score just 11 points in 20 minutes, hardly the kind of numbers expected from him. But Collin Gillespie responded with 16 points and the Wildcats were never even challenged. Villanova has the talent to put teams in an early hole and the depth to keep them from coming back when the starters need a rest. In other words, they’re a dangerous, talented team. Finneran Pavilion. Technically, this is the second game of the renovated Pavilion’s life after opening the season on campus against Morgan State, but Villanova fans are calling this game the true opening night for the building. Playing Villanova in the Pavilion, in front of its large student section, is a lot different than playing the Wildcats in the Wells Fargo Center, which is an NBA arena first and only a part-time home for Villanova. Michigan doesn’t often see arenas as small as the 6,500 seat Pavilion, and for a team that’s not shooting the ball well, it can be an intimidating situation. The Wolverines’ defense keeps them in the game. Let’s be honest: If Michigan couldn’t get going against Norfolk State and Holy Cross, chances are that Villanova isn’t going to be the spot where they start hitting their shots. For Michigan to stay close and get a measure of revenge on Villanova, it must hold the score down by frustrating the Wildcats’ shooters and holding Villanova to one shot. A Michigan cover is going to require an ugly game that’s full of missed shots and tough defense. If one team gets hot, it’s likely to be Villanova, and if the Wildcats start scoring, the Wolverines are doomed. The Wildcats can get either Booth or Paschall established early. The Finneran Pavilion crowd will be looking for any reason to get loud in the first few minutes, and if Booth can find looks from the perimeter or Paschall can outwork Michigan on the glass, Villanova should be able to build a lead that Michigan can’t overcome. The Wildcats played Michigan’s game for 10 minutes last year and promptly fell behind; Wright should have his team ready to play its game from the opening tip this time around. This is a rematch of last year’s national championship game in name only. Both teams lost a lot from last year’s squads, and both are still trying to establish their identities for 2018-19. Villanova seems to be much further along in the process than Michigan. The Wildcats get contributions from all over the court and they can play solid defense. Throw in the talent of two key leaders, and Villanova looks like it’s going to be a threat throughout the season. Michigan will likely get to that level, but the Wolverines aren’t there yet. They haven’t hit against weak opponents, and they’re too dependent on just two players when they have the ball. The one positive for the Wolverines is that they still play excellent defense, which will keep them afloat most nights until the offense gets going. With one excellent defense and one solid defense — and the latter facing a struggling offense — the under is a tempting play here. However, Villanova shoots the 3-pointer well enough that it could easily send the game into the over in the final minutes, given how low the total has been set. The safest play is to back the Wildcats to take advantage of the Wolverines’ poor offensive performance and cover the seven points at home. I’m comfortable laying a reasonable margin with Villanova in its first true test of the season.